The number of people who cope with high levels of blood sugar has been increasing rapidly in all age groups, over the last few years. The incidence among people in their 30’s has jumped 70% in the past decade alone. An estimated 16 million Americans—including at least 300,000 children—have seriously high levels of glucose in their blood. The passage of glucose from the blood into the cells, which helps produce energy, is normally directed by the hormone insulin. In a healthy individual, insulin attaches to special receptors on the surface of cells, signaling the cell walls to open so that the glucose can enter. Once inside the cell, glucose can be stored or burned for energy. If, however, insulin doesn’t work as the door opener, high levels of the blood sugar, glucose, and insulin remain in the blood. Cells may not have enough stored energy for normal functions, and, additionally the extra glucose may get stored as fat. Maintaining a normal blood sugar level is an important part of controlling long-term health. It has been estimated that one in four Americans, approximately 70 million people, could benefit from dietary support to help the body make efficient use of the insulin it already produces. Provides antioxidant protection and helps to recycle vitamins C and E for additional antioxidant activity. * Alpha lipoic acid is a powerful antioxidant in itself, but it also helps recharge the antioxidant protection of vitamins C and E.* Zinc and chromium also have significant effects on oxidative stress. WHO WILL BENEFIT FROM SHAKLEE GLUCOSE REGULATION COMPLEX*? HOW SHOULD SHAKLEE GLUCOSE REGULATION COMPLEX* BE USED? Simply take two capsules daily with a meal. Caution: Do not use this product if you are hypoglycemic. Consult your physician if you have diabetes or are pregnant or nursing. This product is not intended for use by children under age 12. 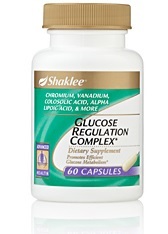 WHAT’S CONTAINED IN SHAKLEE GLUCOSE REGULATION COMPLEX*? Banaba leaf extract/colosolic acid (Langerstroemia speciosa) In laboratory studies, colosolic acid was shown to stimulate glucose uptake. In a series of small studies, an extract standardized to 1% colosolic acid was found to help maintain normal blood glucose levels. Chromium - This is an essential mineral required for normal insulin function. Several studies have found that chromium supplements can support carbohydrate metabolism and blood glucose control. Chromium has been shown to lower oxidative stress. Magnesium - A study of a large group found that women consuming the highest amounts of magnesium had the greatest likelihood of maintaining normal blood sugar levels. Vanadium - This seems to be involved in the regulation of insulin function and the maintenance of normal blood glucose levels. Zinc - A valuable mineral, zinc is believed to help insulin bind properly to insulin receptors on cell walls and plays an important role in insulin production and secretion. Zinc is also a component of the antioxidant enzyme superoxide dismutase, giving it a role in combating oxidative stress. Zinc and chromium each has a significant effect on oxidative stress, but the combination of the two minerals has been shown to be more effective than each alone. Taurine The amino acid taurine has been clinically investigated for a potential role in the control of blood sugar levels. Taurine helps stabilize cell membranes and appears to have free radical scavenging activity. Taurine has also been shown to support normal platelet function. Alpha lipoic acid Experimental studies suggest that alpha lipoic acid may also play a role in glucose transport, in addition to its role in antioxidant protection. WHY CHOOSE SHAKLEE GLUCOSE REGULATION COMPLEX*? ** If for any reason a Shaklee product is not satisfactory, return it to your Shaklee Independent Distributor or Shaklee Corporation for exchange or full refund. Other Ingredients: Maltodextrin in a hard gelatin capsule (Gelatin, Water). If you need more information about blood glucose regulation you will find a very informative website at natural-health.myshaklee.com.